If you were a guest at the Householder house tonight, you'd see a scene similar to this. We'll be snuggled up on the couch. I'll have a kid under each arm. The littler ones. The third one, big brother, within reach. Of all things, we'll be watching WIPEOUT, but we'll be having a great time. Who knew you could make falling down so much fun? And we'll be laughing & talking & having fun. Together. We're not a swan family, but I do love my chicks. And I look forward to times when I know I'll have them nestled under my wings. Me & mine. Nothing better. As I was thinking through my day early this morning, I got these two pictures in my head. The one I just described about my family. The one you see here with the swan family. And that word the word "nestle" came to mind. It means "to lie close & snug, like a bird in a nest; snuggle or cuddle." It comes from a Middle English word, first recorded in 1547 in reference to person settling or snuggling. Just like a bird in it's nest. It's an intimate word. A close word. A comfortable word. The Holy Spirit got my attention next. There are word pictures in Scripture. Particularly in Psalms. 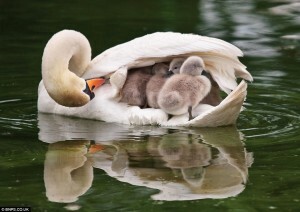 Speaking of our Heavenly Father tenderly covering us, His chicks, beneath his sheltering wings nestled therein. I do not know what wipe out or disaster you may be facing, Dear Reader, but I do know. With certainty. That our Faithful Father will be your rampart. Your shield. Your refuge. Find yourself nestled into His wings. And find yourself secure. Would you consider sharing a note of praise or a request for prayer in the comments?